Thanks to Tash, Mike, Ben and Deb and all your team of special agents for inviting me and looking after us so amazingly. And, extra special thanks to the Webstock participants for indulging me during this and the fine conversations with you all in the bar afterwards! If you were there and enjoyed it – run, don’t walk to Adam Greenfield’s site and pre-order “The City is here for you to use”! I’m a designer that mainly works with digital materials, and while the pleasure of tinkering with a machine is something that I get quite a lot in software, to tinker in hardware and software (especially Meccano) is a rarer thing. It seems to activate a way of thinking with the eye, the mind and the hand that is entirely natural, and the playful problem-solving instincts of childhood come rushing back. Kevin Kelly writes in an essay about Artificial Intelligence that problem-solving is not just an abstract process of the mind, but something that happens in the world, and brands those who don’t believe this as indulging in ‘thinkism’. The intelligence of the hand, and the eye, and the body, working with material things in the world, instead of abstract symbols in a computer you might call ‘Do-ism’. Technology is not the enemy. Inattention and waste are the enemy. If you don’t notice your footprints you won’t clean them up. So remember to take notes and use whatever tools can to keep you paying attention. Twitter / C. S. J. Bofop: No pants!, originally uploaded by moleitau. Go read the lot of it. The Book Arrives!, originally uploaded by Jamais Cascio. 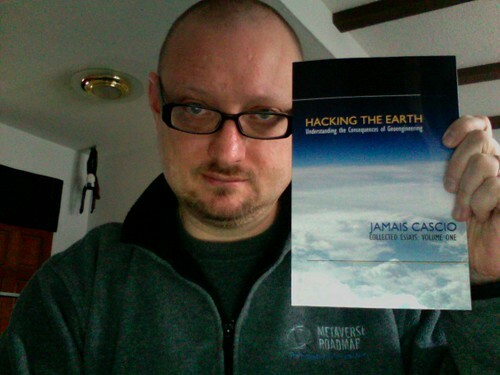 Futurist and all-round-smart-cookie Jamais Cascio has a book out taking a sober and critical look at geoengineering. It’s called “Hacking The Earth” and it’s available from Lulu. I’m in Wellington, New Zealand at WebStock. It’s the first session – Jane McGonigal is talking about games, and I start thinking about the less-goal directed, more ambiguous world of play – my twin obsession with place. Warning – this is a collection of half-formed thoughts, perhaps even more than usual. I’d been wanting to write something about Google Latitude, and other location-sharing services that we (Dopplr) often get lumped in with for a while. First of all, there was the PSFK Good Ideas Salon, where I was thinking about it (not very articulately) then shortly after that Google Latitude was announced, in a flurry of tweets. My attitude to most Location-Based Services (or LBS in the ancient three-letter-acronymicon of the Mobile Industry) has been hardened by sitting through umpty-nine presentations by the white-men-in-chinos who maintain a fortune can be made by the first company to reliably send a passer-by a voucher for a cheap coffee as they drift past *bucks. It’s also been greatly informed by working and talking with my esteemed erstwhile colleague Christopher Heathcote who gave a great presentation at Etech (5 years ago!!! Argh!) called “35 ways to find your location“, and has both at Orange and Nokia been in many of the same be-chino’d presentations. Often, he’s pointed out quite rightly, that location is a matter of routine. We’re in work, college, at home, at our corner shop, at our favourite pub. These patterns are worn into our personal maps of the city, and usually it’s the exceptions to it that we record, or share – a special excursion, or perhaps a unexpected diversion – pleasant or otherwise that we want to broadcast for companionship, or assistance. Also, most of the time – if I broadcast my location to trusted parties such as my friends, they may have limited opportunity to take advantage of that information – they after all are probably absorbed in their own routines, and by the time we rendevous, it would be too late. Location-based services that have worked with this have had limited success – Dodgeball was perhaps situated software after all, thriving in a walkable bar-hopping subculture like that of Manhattan or Brooklyn, but probably not going to meet with the same results worldwide. This attitude carried through to late 2006/early 2007 and the initial thinking for Dopplr – that by focussing on (a) nothing more granular than cities-as-place and days-as-time and (b) broadcasting future intention, we could find a valuable location-based service for a certain audience – surfacing coincidence for frequent travellers. “I explained that I wasn’t actually begging for company; I was just telling people where I was. But it’s an understandable misperception. This is new territory, and there’s no established etiquette or protocol. This is also a reason that we were keen to connect with FireEagle (aside from the fact that Tom Coates is a good friend of both myself and Matt B.) in that it has the potential to act as a broker between elements in the stack, and in fact help, weave the stack in the first place. At the moment, it’s a bit like being a hi-fi nerd connecting hi-specification separates with expensive cabling (for instance, this example…), but hopefully an open and simple way to control the sharing of your whereabouts for useful purposes will emerge from the FE ecosystem or something similar. Point (b) though, still has me thinking that sharing your precise whereabouts – where you are right now, has limited value. It’s a representation of an observer moving through space and time, with the future represented by the ‘lightcone’ at the top, and the past by the one at the bottom. I’ve generally used it to emphasise that Dopplr is about two things – primarily optimising the future via the coincidences surfaced by people sharing their intended future location with people they trust, and secondly, increasingly – allowing you to reflect on your past travels with visualisations, tips, statistics and other tools, for instance the Personal Annual Reports we generated for everyone. It also points out that the broadcasting of intention is something that necessarily involves human input – it can’t be automated (yet)- more on which later. By concentrating on the future lightcone, sharing one’s intentions and surfacing the potential coincidences, you have enough information to make the most of them – perhaps changing plans slightly in order to maximise your overlap with a friend or colleague. It’s about wiggling that top lightcone around based on information you wouldn’t normally have in order to make the most of your time – at the grain of spacetime Dopplr operates at. Google Latitude, Brightkite and to an extent FireEagle have made mee think a lot about the grain of spacetime in such services, and how best to work with it in different contexts. Also, I’ve been thinking about cities a lot, in preparation for my talk at Webstock this week – and inspired by Adam‘s new book, Dan’s ongoing mission to informationally refactor the city and the street, Anne Galloway and Rob Shield’s excellent “Space and culture” blog and the work of many others, including neogeographers-par-excellance Stamen. I’m still convinced that hereish-and-soonish/thereish-and-thenish are the grain we need to be exploring rather than just connecting a network of the pulsing ‘blue-dot’. “The problem with these geolocative services is that they assume you’re a precise, rational human, behaving as economists expect. No latitude for the unexpected; they’re determined to replace every unnecessary human interaction with the helpful guide in your pocket. Red dot fever enforces a precision into your design that the rest must meet to feel coherent. There’s no room for the hereish, nowish, thenish and soonish. The ‘good enough’. My antipathy to the here/now fixation in LBS lead me to remix the lightcone diagram and post it to flickr, ahead of writing this ramble. The results of doing so delighted and surprised me. In retrospect, it wasn’t the most nuanced representation of what I was trying to convey – but it got some great responses. Read the entire thread at Flickr – it gets crazier. 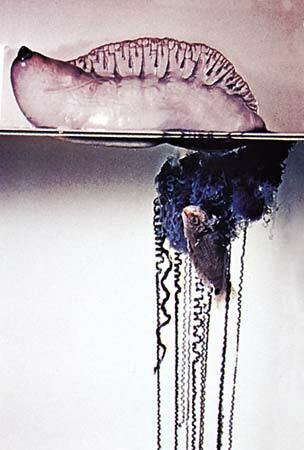 But, interwoven in the discussion of the Possibility Jellyfish, came comments about the relative value of place-based information over time. Chris Heathcote pointed out that sometimes that pulsing blue dot is exactly what’s needed to collapse all the ifs-and-buts-and-wheres-and-whens of planning to meet up in the city. Some great little current examples of software acting on exact real-time location (other than the rather banal and mainstream satnav car navigation) are Locale for Android – a little app that changes the settings of your phone based on your location, or iNap, that attempts to wake you up at your rail or tube stop if you’ve fallen asleep on the commute home. But to return to Mr. Coates. Tom’s been thinking and building in this area for a long time – from UpMyStreet Conversations to FireEagle, and his talk at KiwiFoo on building products from the affordances of real-time data really made me think hard about here-and-now vs hereish-and-nowish. Tom presented some of the thinking behind FireEagle, specifically about the nature of dealing with real-time data in products an services. In the discussion, a few themes appeared for me – one was that of the relative-value of different types of data waxing and waning over time, and that examining these patterns can give rise to product and service ideas. Secondly, it occured to me that we often find value in the second-order combination of real-time data, especially when visualised. Need to think more about this certainly, but for example, a service such as Paul Mison’s “Above London” astronomical event alerts would become much more valuable if combined with live weather data for where I am. Thirdly, bumping the visualisation up-or-down a scale. In the discussion at KiwiFoo I cited Citysense as an example of this – which Adam Greenfield turned me onto – where the aggregate real-time location of individuals within the city gives a live heatmap of which areas are hot-or-not at least in the eyes of those who participate in the service. From the recent project I worked on at The Royal College of Art, Hiromi Ozaki’s Tribal Search Engine also plays in this area – but almost from the opposite perspective: creating a swarming simulation based on parameters you and your friends control to suggest a location to meet. 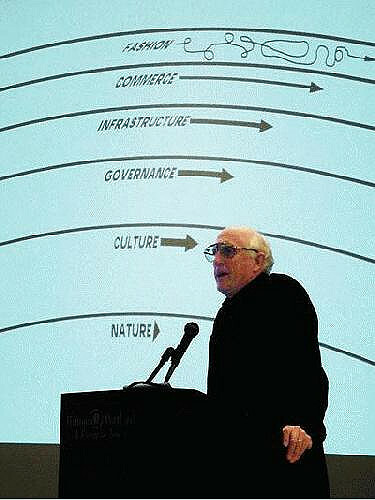 It seems to me that a lot of the data being thrown off by personal location-based services are in the ‘fashion’ strata of Stewart Brand’s stack. What if we combined it with information from the lower levels, and represented it back to ourselves? 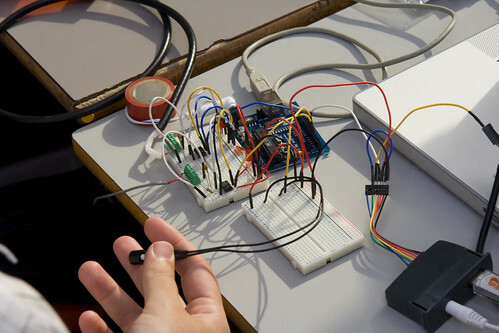 Let’s try putting jumper wires across the strata – circuit-bending spacetime to create new opportunities. Finally, I said I’d come back to the claim that you can’t automate the future – yet. In the Kiwifoo discussion, the group referenced the burgeoning ability of LBS systems to aggregating patterns of our movements. One thing that LBS could do is serve to create predictive models of our past daily and weekly routines – as has been investigated by Nathan Eagle et al in the MIT Reality Mining project. I’ve steered clear of the privacy implications of all of this, as it’s such a third-rail issue, but as I somewhat bluntly put it in my lightcone diagram the aggregation of real-time location information is currently of great interest to spammers, scammers and spooks – but hopefully those developing in this space will follow the principles of privacy, agency and control of such information expounded by Coates in the development of FireEagle and referenced in our joint talk “Polite, pertinent and pretty” last year. The downsides are being discussed extensively, and they are there to be sure: both those imagined, unimagined, intended and unintended. But, I can’t help but wonder – what could we do if we are given the ability to export our past into our future…?